If you have ever considered selling items at auction but still haven't committed to the idea below are a few reasons to help with your decision. Quick Turnaround. An auction is immediate. It's quick and efficient and you will receive your check in 14 business days. No Hassle. If you are trying to sell an item yourself, its your responsibility to "show" the item and coordinate with potential buyers, at auction we handle all that for you. Drop the Insurance. If you are selling a vehicle you can drop the insurance and turn in the tags as soon as it arrives on our auction yard. Comprehensive Marketing. 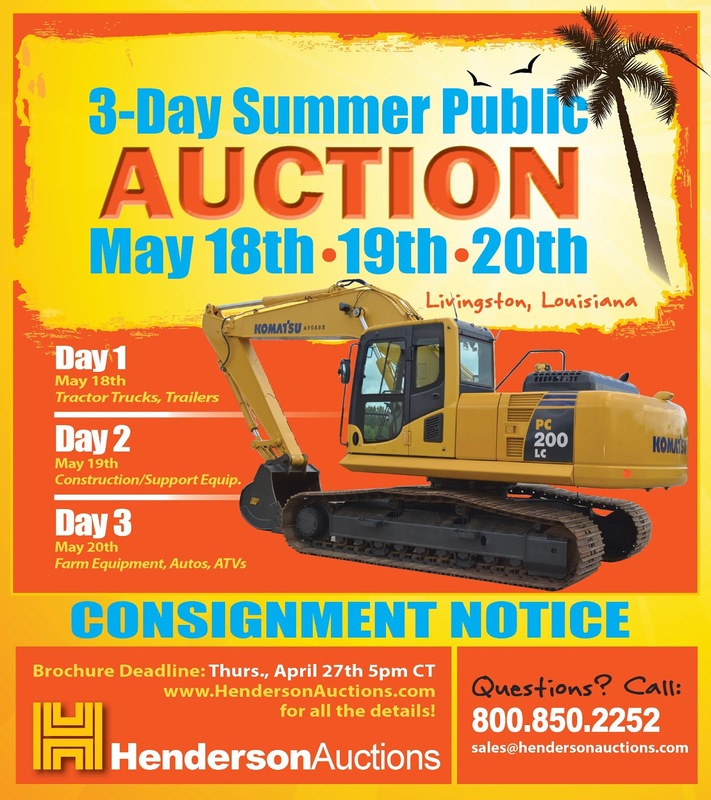 Henderson Auctions covers all the cost of advertising and marketing your piece of equipment reaching domestic and international buyers. Buyers come Prepared to Buy. Auction goers come prepared to spend some strategically study the market and items they want to purchase, others are impulsive buyers. No Negotiations. There is no haggling over price or merchandise. Auctions Work Well in Both Good and Bad Economic Times. People love auctions, because they love sales. Statistics show, in a good or bad economy auctions remain a steady force. for all the details and information on all our upcoming auctions. Call 800-850-2252 or 225-686-2252 with any questions about auction fees and the entire auction process, we would love to speak with you!